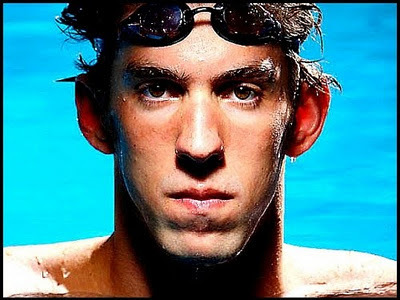 Michael Fred Phelps (born June 30, 1985) is an American swimmer who has, overall, won 16 Olympic medals—six gold and two bronze at Athens in 2004, and eight gold at Beijing in 2008, becoming the most successful athlete at both of these Olympic Games editions. In doing so he has twice equaled the record eight medals of any type at a single Olympics achieved by Soviet gymnast Alexander Dityatin at the 1980 Moscow Summer Games. His five golds in individual events tied the single Games record set by Eric Heiden in the 1980 Winter Olympics and equaled by Vitaly Scherbo at the 1992 Summer Games. Phelps holds the record for the most gold medals won in a single Olympics, his eight at the 2008 Beijing Games surpassed American swimmer Mark Spitz's seven-gold performance at Munich in 1972. Phelps' Olympic medal total is second only to the 18 Soviet gymnast Larisa Latynina won over three Olympics, including nine gold. Furthermore, he holds the all-time record for most individual gold Olympic medals, at nine. Phelps's international titles and record breaking performances have earned him the World Swimmer of the Year Award six times and American Swimmer of the Year Award eight times. He has won a total of fifty-nine medals in major international competition, fifty gold, seven silver, and two bronze spanning the Olympics, the World, and the Pan Pacific Championships. His unprecedented Olympic success in 2008 earned Phelps Sports Illustrated magazine's Sportsman of the Year award. After the 2008 Summer Olympics, Phelps started the Michael Phelps Foundation, which focuses on growing the sport of swimming and promoting healthier lifestyles. As a participant in the US Anti-Doping Agency's "Project Believe" program, Phelps is regularly tested to ensure that his system is clean of performance-enhancing drugs (Wikipedia).